The Pokémon summons a hailstorm in battle. X During cold seasons, it migrates to the mountain’s lower reaches. It returns to the snow-covered summit in the spring. X Im Winter steigt es bis zum Fuß der Berge herab. Im Frühjahr kehrt es auf den Gipfel zurück. X Il s’aventure jusqu’au pied des montagnes en hiver, mais se réfugie sur les pics neigeux au printemps. X En las estaciones frías baja al pie de la montaña, pero regresa a las cimas nevadas en primavera. X In inverno scende a valle, ma in primavera se ne torna sulle cime montuose dove c’è ancora neve. X 추운 계절에는 산기슭까지 내려오지만 봄이 되면 눈이 남아 있는 산 정상으로 돌아간다. Y In the spring, it grows berries with the texture of frozen treats around its belly. Y Im Frühjahr wachsen Beeren, die wie gefrorene Süßigkeiten aussehen, um seinen Bauch herum. Y Au printemps, il fait pousser des Baies pareilles à des crèmes glacées autour de son ventre. Y En primavera, le crecen bayas con apariencia de helado alrededor de la panza. Y In primavera, attorno al ventre gli crescono delle bacche simili a dolci ghiaccioli. Y 봄이 되면 아이스캔디와 같은 촉감의 나무열매가 배의 주위에 열린다. 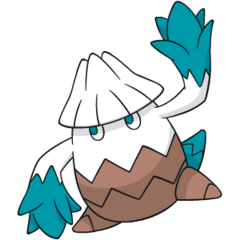 Omega Ruby In the spring, it grows berries with the texture of frozen treats around its belly. Omega Ruby Im Frühjahr wachsen Beeren, die wie gefrorene Süßigkeiten aussehen, um seinen Bauch herum. Omega Ruby Au printemps, il fait pousser des Baies pareilles à des crèmes glacées autour de son ventre. Omega Ruby En primavera, le crecen bayas con apariencia de helado alrededor de la panza. Omega Ruby In primavera, attorno al ventre gli crescono delle bacche simili a dolci ghiaccioli. Omega Ruby 봄이 되면 아이스캔디와 같은 촉감의 나무열매가 배의 주위에 열린다. 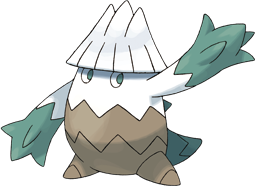 Alpha Sapphire During cold seasons, it migrates to the mountain’s lower reaches. It returns to the snow-covered summit in the spring. Alpha Sapphire Im Winter steigt es bis zum Fuß der Berge herab. Im Frühjahr kehrt es auf den Gipfel zurück. Alpha Sapphire Il s’aventure jusqu’au pied des montagnes en hiver, mais se réfugie sur les pics neigeux au printemps. Alpha Sapphire En las estaciones frías baja al pie de la montaña, pero regresa a las cimas nevadas en primavera. Alpha Sapphire In inverno scende a valle, ma in primavera se ne torna sulle cime montuose dove c’è ancora neve. Alpha Sapphire 추운 계절에는 산기슭까지 내려오지만 봄이 되면 눈이 남아 있는 산 정상으로 돌아간다. Diamond It lives in snowy mountains. Only rarely does it go near the scarcely encountered humans. Pearl When spring comes, berries that feel like ice candies will grow around its stomach. Platinum Seemingly curious about people, they gather around footsteps they find on snowy mountains. HeartGold During cold seasons, it migrates to the mountain’s lower reaches. It returns to the snow-covered summit in the spring. SoulSilver During cold seasons, it migrates to the mountain’s lower reaches. It returns to the snow-covered summit in the spring. Black Seemingly curious about people, they gather around footsteps they find on snowy mountains. White Seemingly curious about people, they gather around footsteps they find on snowy mountains. Black 2 Seemingly curious about people, they gather around footsteps they find on snowy mountains. White 2 Seemingly curious about people, they gather around footsteps they find on snowy mountains.